The Sunday Paper made into a full-color, interacting system for storytelling and play! Beulah Land© is a felt storyboard kit like none you’ve ever seen. Beulah Land is The Sunday Paper made into a full-color, interactive system for storytelling and imaginative play. 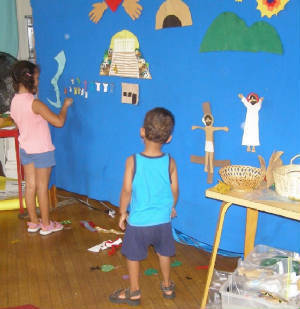 It will help you enhance or introduce storytelling in your ministry with children. “We’ve used Beulah Land for only 3 sessions so far, but you just know when something is going to be right for you. We’ve done Creation, Adam and Eve and Jerusalem—Jerusalem was a godsend, because it was a grand sweep through all of the last 2 terms’ work, and it’s lovely not to have to dream up my own materials. The language is so good for a broad age range. Considering how sophisticated their computer games are, I was pleasantly surprised, and amused, when they went WOW! as I put up the big Jerusalem piece. ... The 2 great bonuses it has over Godly Play are that it covers far more stories and topics, and needs so little storage by comparison! It’s given us a new lease of life, so many thanks for introducing it to us! 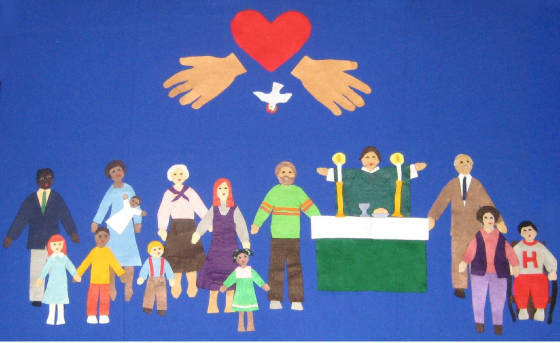 BEULAH LAND’S STARTER SET contains 25 colors of felt, pre-printed with outlines for over 200 pieces for Creation, Noah, Christmas, Easter, and the Apostles’ Creed. Beulah Land set 2, The Salvation Story, includes Old Testament landscapes, Abraham, Exodus, Jerusalem; New Testament people, the disciples, a church, font, altar, and priest and people in modern dress. Sets 3A (Old Testament heroes) and 3B (Acts), add many new settings and characters for telling favorite Bible stories of courage and adventure. Set 4 (Gospel stories and Parables) fills in the details of the Gospel message! Each set comes with its own manual, containing complete assembly instructions, story scripts, storytelling hints, and insights on children’s spirituality. 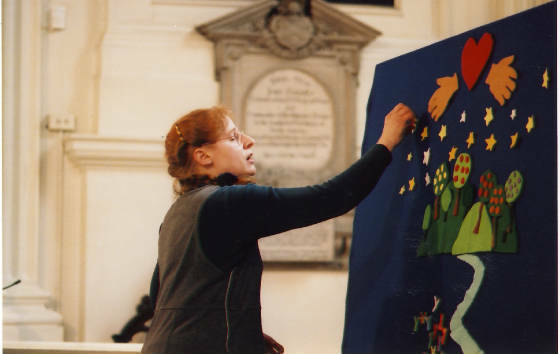 A demonstration video is also available, capturing a live performance by Gretchen Pritchard of the entire salvation story, from “Once upon a time” to “happily ever after,” using Beulah Land feltboard figures. All Beulah Land sets include pre-printed felt, assembly instructions, story scripts and notes. Old Testament heroes: Jacob, Joseph, Samuel, Ruth, David, Daniel and more! Salvation story DVD: Live video of the story from Genesis to Revelation! One hour. 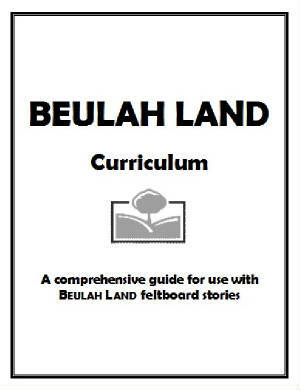 The Beulah Land curriculum completes Beulah Land by providing a full year’s program for children 3 to 10, based on Beulah Land feltboard stories. Also included: 3 suggested orders of worship, an abundance of background information on scripture and children’s spirituality; practical tips, and references to other resources. 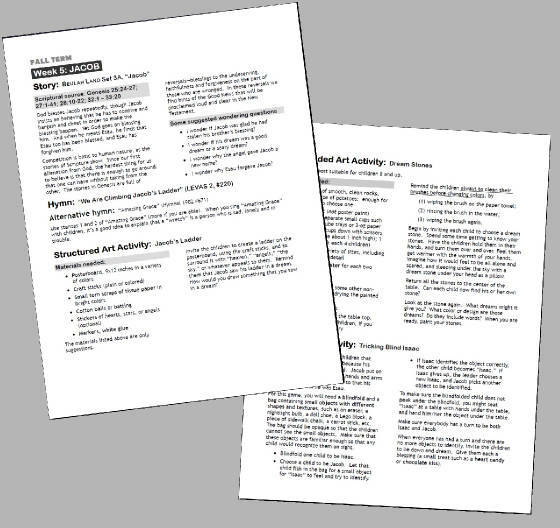 Purchase of the Beulah Land curriculum comes with permission to make copies for use in your ministry or program. To order, click on the Order Forms tab, or call 203-624-2520.